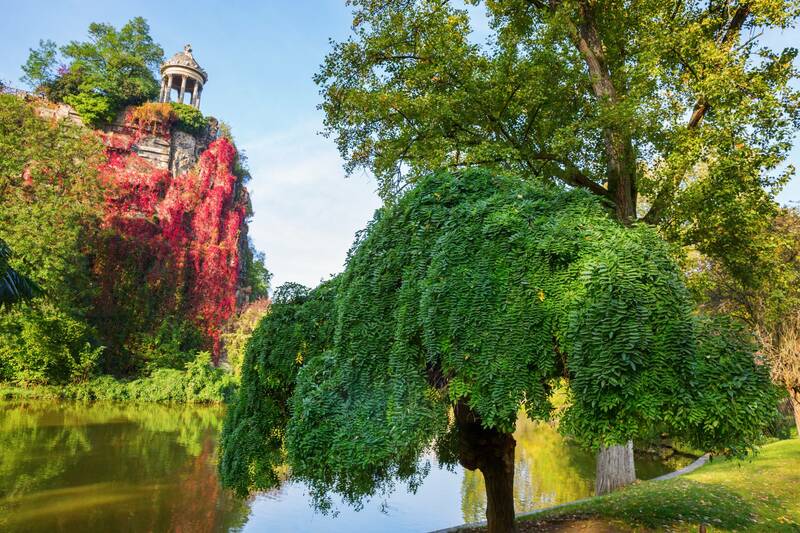 The Parc des Buttes-Chaumont is a public park situated in northeastern Paris, in the 19th arrondissement. 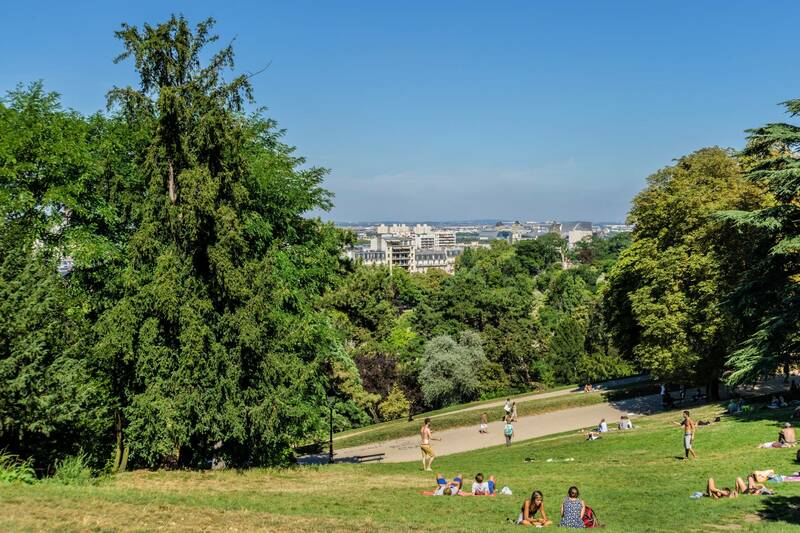 Occupying 24.7 hectares (61 acres), it is the fifth-largest park in Paris, after the Bois de Vincennes, the Bois de Boulogne, the Parc de la Villette and the Tuileries Garden. It was opened in 1867, late in the regime of Emperor Napoleon III, and was built by Jean-Charles Alphand, who created all the major parks of Napoleon III. The park has 5.5 kilometres (3.4 miles) of roads and 2.2 kilometres (1.4 miles) of paths. The most famous feature of the park is the Temple de la Sibylle, inspired by the Temple of Vesta in Tivoli, Italy, perched at the top of a cliff fifty metres above the waters of the artificial lake. The heart of the park is an artificial lake of 1.5 hectares (3.7 acres) surrounding the Île de la Belvédère, a rocky island with steep cliffs made from the old gypsum quarry. On the top is the Temple de la Sibylle, fifty meters above the lake. The island is connected by two bridges with the rest of the park. the island is surrounded by paths, and a steep stairway of 173 steps leads from the top of the belvedere down through the grotto to the edge of the lake. The most famous feature of the park is the Temple de la Sibylle, a miniature version of the famous ancient Roman Temple of Vesta in Tivoli, Italy. The original temple was the subject of many romantic landscape paintings from the 17th to the 19th century, and inspired similar architectural follies in the English landscape garden of the 18th century. The temple was designed by Gabriel Davioud, the city architect for Paris, who designed picturesque monuments for the Bois de Boulogne, Bois de Vincennes, Parc Monceau, and other city parks. He also designed some of the most famous fountains of Paris, including the Fontaine Saint-Michel. The temple was finished in 1867. The grotto is a vestige of the old gypsum and limestone quarry that occupied part of the site, now adjacent to rue Botzaris on the south side of the park. It is fourteen meters wide and twenty meters high, and has been sculpted and decorated with artificial stalactites as long as eight meters to make it resemble a natural grotto, in the style of the romantic English landscape garden of the 18th and 19th century. An artificial waterfall, fed by pumps, cascades from the top of the cave and down through the grotto to the lake. A 63-meter-long suspension bridge, eight meters above the lake, allows access to the belvedere. The bridge was designed by Gustave Eiffel, the creator of the Eiffel Tower. A 12-metre (39 ft) masonry bridge, 22 metres (72 ft) above the lake, known as the "suicide bridge", allows access to the belvedere from the south side of the park. After a series of well-publicized suicides, the bridge is now fenced with wire mesh. Most of the architecture of the park, from the Temple de la Sibylle, the cafes and gatehouses to the fences and rain shelters, was designed by Gabriel Davioud, chief architect for the city of Paris. He created a picturesque, rustic style for the parks of Paris, sometimes inspired by ancient Rome, sometimes by the chalets and bridges of the Swiss Alps. The main entrance to the park is at Place Armand-Carrel, where the mairie (town hall) of the 19th arrondissement, also designed by Davioud, is located. There are five other large gates to the park: Porte Bolivar, Porte de la Villette, Porte Secrétan, Porte de Crimée, and Porte Fessart, as well as seven smaller gates on the park perimeter. The park currently hosts three restaurants (Pavillon du Lac, Pavillon Puebla, and Rosa Bonheur), two reception halls, two Guignol theatres, and two waffle stands. Notably, in 1892, the two Guignol theatres were established in the park and have become popular attractions for generations of visitors. As part of a citywide wireless Internet-access plan, the park has activated four wi-fi zones. When established in 1867, the park was envisioned by Napoleon III as a garden showcase. This original intent of the park continues to guide the park's direction. Currently, there are over 47 species of plants, trees, and shrubs cultivated in the park. Many of the plants and trees found in the park were those originally planted when the park was created. The park boasts many varieties of indigenous and exotic trees (many of which are Asian species): in particular, several cedars of Lebanon planted in 1880, Himalayan cedars, Ginkgo Biloba, Byzantine hazelnuts, Siberian elms, European hollies, and bamboo-leafed prickly ashes, among many others. Parc des Buttes Chaumont | eTips Inc.